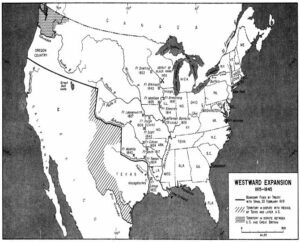 The 1800s drove resounding territorial changes through new America and engineered the laws and borders of State of Colorado and the City of Denver. At the start of the 19th century, the Senate was moving into the basement of the United States Capitol building in Washington, D.C., and Spain handed over Louisiana Territory to France. By the end of the end of the century, Colorado’s borders would be carved out of Louisiana Territory, and Colorado would have its own Senate representatives. The Louisiana Territory was 828,000,000 square miles of land that beckoned spirited Americans to explore the unknown and discover riches. The Mississippi River and the Rocky Mountains conveyed its borders, but those borders went through multiple changes after the purchase of the Louisiana Territory in 1803. Back in 1807, an exploring spy named Zebulon Montgomery Pike was trying to find out where the Arkansas River began but was taken into custody by Spanish forces while exploring what is known today as Alamosa, Colorado. He was released after five months and documented his adventures and explorations. His records included the sightings of what we now know as the highest summit in the front range of the Rocky Mountains. Although Zebulon Pike never reached the mountain, he did send two grizzly bear cubs to Thomas Jefferson, and his published writings about the Colorado expedition brought interest to the area. Pike’s Peak became aptly named after the published spy-explorer. Zebulon Pike didn’t think the mountain could be climbed, but in 1820, Stephen Long, and botanist Edwin James succeeded. The mountain was then named James Peak in honor of the botanist, but Pike’s Peak was still the popular name. Julia Holmes was the first woman to climb Pike’s Peak in 1858, prior to that, a carriage road was made to the top in 1833. In 1889, a railroad was built to the top, and in 1900 John Brisben Walker drove his car (locomobile) up the Colorado peak 11,000 feet, about 4,000 feet shy from reaching the top. (John Brisben Walker opened Denver’s first amusement park in 1880 and staged Denver’s first rodeo. From 1889-1905, he was editor of Cosmopolitan magazine. Today, Pike’s Peak is a popular Colorado tourist destination. Who said it was impossible? You can’t help but notice the Rocky Mountains, but the Rocky Mountains didn’t draw the crowds into Colorado like gold did. Gold was the driving influence of Colorado’s first population influx. Gold had been discovered in the Rocky Mountains by Indians and soldiers, and by Zebulon Pike, but at first, the news didn’t spread fast. In 1843, future Governor William Gilpin discovered placer gold near Cherry Creek, but he was busy looking for a way to cross the Continental Divide. The gold rush in California was well underway in 1850, but it wasn’t until 1858 that the gold rush started in Denver, Colorado, and that was eight years after Lewis Ralston discovered gold in the Clear Creek, Ralston Creek water merge in Arvada, Colorado. Back then, Denver was the small town of Auraria in Kansas Territory, with the fresh waters of the South Platte River and Cherry Creek Confluence nearby. (Colorado at the time was split into four territories: Oregon, Utah, New Mexico, and Kansas.) Historians believe that as many as 100,000 prospectors headed to Colorado in 1859. It was a busy year, and the first constitutional convention also took place in 1859 at Blake and Williams Hall on Blake Street in Denver. The formal debate whether Colorado should be a state or territory was the highlight of conversation. Though a constitution was written, it was rejected by voters who preferred Colorado being in a territory over being a state of the Union. In 1859, they made a provisional government in Jefferson Territory. By 1860, the two cities merged, and Denver picked up new speed, five printers at the Rocky Mountain News formed Colorado’s first Union (#49), and the first church was erected. In 1861, Colorado became the Territory of Colorado and Abraham Lincoln assigned Gilpin as the Governor of the Territory of Colorado for a year salary of $1,500. Gilpin was a futurist, and foresaw the imploding population Colorado Territory would experience, as evidenced in his publication “The Central Gold Region.” He was a firm believer that Denver would be the capital of the west. That year, the first legislative assembly was held, and Colorado’s 17 original colonies were formed, with Arapahoe the first county in the new state of Colorado. Golden City was originally the capital of Colorado in territorial legislation, but Denver was made the capital in 1866 with the new legislation. Nathaniel P. Hill served beside Governor Gilpin as a member of the Territorial Council of Colorado in 1872 and 1873. He was born in New York, and lived in Rhode Island and Europe for a while, but eventually called Colorado his home. In 1867 Mr. Hill started to manage the Boston and Colorado Smelting Company. Alexander Cameron Hunt was the Territorial Governor of Colorado from 1867 to 1869. At 16, the New York born boy made his way from Illinois to California and got rich. After heading back to Illinois, he became a mayor, but also went bankrupt. He packed up his family in an ox wagon to head to Colorado in the Pike’s Peak Gold Rush frenzy. The then-future governor settled in western Denver to live in a cabin and open a restaurant, which later failed. After having success in the Colorado lumber business, he was later elected president of the People’s Court and took on the position of being a U.S. Marshal of Colorado Territory. In 1867, President Andrew Johnson appointed the U.S. Marshal to be Governor of the Territory of Colorado. He only served two years due to the changing political forces in the presidency. Ulysses S. Grant took office and appointed Edward Moody to replace Alexander Cameron as Governor of the Territory of Colorado. Early Denver legislators tried again to convince territorial advocates that Colorado should join the Union. In 1863, another bill for statehood failed, and in 1865 another draft constitution was vetoed by then-President Andrew Johnson. From 1869 to 1873 every bill for Colorado to become a state failed. In 1874, House Bill 435 was submitted for Colorado’s statehood. The bill finally passed, and was signed by President Ulysses S. Grant. Colorado was officially a member of the United States of America. The original Colorado State Constitution was written in three languages: English, Spanish and German. Adopted in 1876, it set forth the geographical boundaries, provided a Bill of Rights, gave powers to the Legislative, Judicial and Executive branches, defined Senatorial Districts, gave power to create a police force, gave men over the age of 21 the right to vote, and gave power for the General Assembly to enact voting rights for women. The Constitution established that education institutions, penal institutions, and mental institutions would be supported by the state. Article 16 of the Constitution was dedicated to Mining and Irrigation, and Article 18 defined a felony. Many laws were simply replicas from other states, but the legislature made an effort to create a militia to protect the gold and be on alert for any future threats from the Indians or rebels from the Confederacy. There was discord over the funding for the militia, but eventually, it proved necessary for Confederate protection. Colorado made an effort to drive the Indians out, and in 1868, the Native Indians had to concede land. Henry M. Teller is the first Senator of Colorado, serving from 1876 to 1882. Though he was born in New York and received his law degree from New York, he moved in Colorado in 1861. He resigned to become the United States Secretary of the Interior from 1882 to 1885, then resumed his position as Colorado Senator from 1885-1909. He sought to strip Native Americans of their land, and prohibit Native American ceremonies, and was one of the few senators that switched political parties while serving as Senator. George M. Chilcott was a Pueblo Colorado resident that served as Senator from 1882 to 1883. In 1863, he was appointed by President Lincoln as Register of the United States Land Office for Colorado. Colorado, like many states, adopted the concept of felonies and the death penalty from English common law. Back in 1779, Thomas Jefferson sought to reduce the death penalty in Virginia in Bill 64 but lost by one vote. A death penalty reform era began around 1833, and public hangings were getting out of control and attended by thousands. Souvenirs were sold, and drinking celebrations occurred during the hanging and lasted well into the night. Private hangings were the solution for social order. From 1833 to 1849, private hangings were the new criminal procedure in 15 states. Pennsylvania was the first state to move hangings from public view to inside a correctional facility. In 1845, the First National Death Penalty Abolition Society was formed, and in 1846 Michigan was the first to abolish the death penal for every crime except treason. Colorado was a newly formed state, and hangings were still done in public. In 1859, at the height of Colorado’s Pike’s Peak gold rush, John Stoefel left camp with relatives to look for stray cattle then came back alone. Stoefel confessed to murder and a body was found. Judge Seymour W. Wagoner sentenced Stoefel for the murder, and Stoefel was subsequently hanged for his crime. This is the first recorded execution as reported in Denver’s Rocky Mountain News. However, Colorado was not yet a state, and it was a part of Kansas Territory. Denver was then in Arapahoe County. In Denver, Colorado during 1860, a man by the name Moses Young killed his former roommate over a money dispute on March 13th. On March 14th, he was tried for murder, and was sentenced to hang. The next day, March 15th, the gallows were set up in Cherry Creek where the murder took place. Moses prayed with the Reverend, then was brought hands tied and head covered to the trap door. His neck snapped as he was hung at 4:21 p.m. on March 15th. This case was reported in the Golden Western Mountaineer on March 21, 1860. In June of that same year, the Rocky Mountain News reported that 1000 people showed up at a Denver court to witness a murder trial for Marcus Gredler, so the Denver court has to move the proceedings outside. Judge slaughter presided over the jury trial, and Gredler was found guilty the day after the murder, and hung the day after the murder conviction. A few other hanging occurred in the late 1800s before Colorado became a state, but it wasn’t until 1890 that Colorado’s first execution took place as an act of the State of Colorado. Noverto Griego was hanged in the Colorado State Penitentiary on November 12, 1890 for the capital offense crimes of Robbery and Murder. Across the United States, over 5000 executions had taken place by that time. Between 1897 and 1901 Colorado abolished the death penalty. 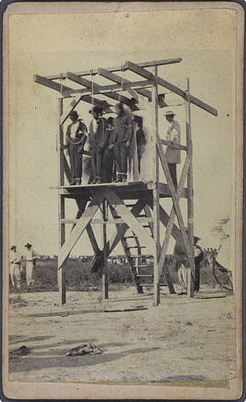 Public hangings were outlawed after a crowd of almost 20,000 people showing up for the botched hanging of Andrew Green in 1886. A man could be hung twice. Celebratory drinking was popular at hangings, but the Temperance movement of the 19th century wanted to put an end to that. After the war of 1812, the United States set forth on the road to its industrial revolution. Machines were invented at unprecedented rates, along with new energy sources and metals. Domestic work turned to factory work. Record numbers of people were leaving their homes to work in factories and businesses. Productivity meant profit. Along with the industrial revolution in America, came the beginning of a religious anti-alcohol movement called Temperance. 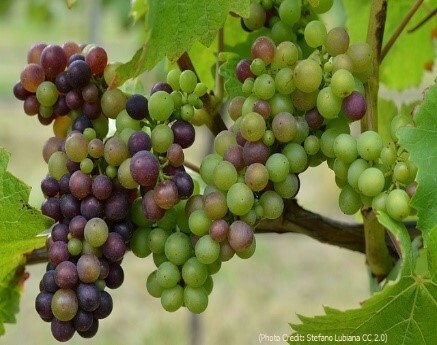 This was also the start of the “two-wine” doctrine that changes classical biblical interpretation of wine to mean some verses meant wine, and some verses meant grape juice. During the first festering of the Temperance movement, Taverns took a turn from being social centers, to being seen as stigmatized and scandalous. (Even Abraham Lincoln had a tavern license.) When the Temperance movement began, it started as a quest for moderation, not abstinence from alcohol. The American Temperance Society members originally drank beer and wine, but encouraged everyone to stay away from the rum, whiskey, and other strong liquors. In 1838, the first prohibition law passed in Tennessee. The prohibition law made it a misdemeanor to sell alcoholic beverages in taverns and stores. Eventually, the Temperance movement became a strong propaganda based force to eliminate alcohol. The American Tract Society handed out five million tracts on Temperance, and that was just a fraction of the total distributed literature. The Temperance movement was also created in response to the recognition of alcoholism as a disease in 1805. It wasn’t until 1849 that Magnus Huss coined the phrase “Alcoholismus chronicus” that the term alcoholism was used. Decades before that, Dr. Benjamin Rush published papers on the merits of alcoholism studies and sober houses. He is referred to as the founder of psychiatry, and sometimes referred as the founder of the Temperance movement, but he never advocated total eradication of alcohol. In 1879, Dr. Leslie Keeley opened the Keely Institute, a predecessor to today’s group therapy for addiction and the methods of Alcoholics Anonymous. In 1893, the The Ohio Anti-Saloon League formed and just two years later it turned into the Anti-Saloon League of America. Religion was still the cure for alcoholism to many, but instead of expelling demons, religious rescue workers preached abstinence and religious conversion while opening “inebriate homes” to house the drunkards. Freud and other psychiatrists began treating alcoholism with morphine, cocaine and cannabis. In 1886, Coca-Cola was introduced as a Temperance beverage. The Bacardi Distillery was founded much earlier in 1862, and the first legend of rum and coke took place in 1889. When U.S. Occupied Cuba, the soldiers brought Cocoa Cola. Legend has it, a U.S. Army captain ordered a rum and coke with a slice of lime and made a toast in celebration of a free Cuba. Cheers. Overseas, England was well into its industrial revolution, and traffic problems were being addressed. In 1872 Parliament passed the Licensing Act, a predecessor to America’s 20th century driving while intoxicated and driving under the influence laws. In London during 1887, the first arrest was made for driving under the influence. A cab driver crashed his car into a building and was fined 25 shillings. Drunk Driving laws didn’t make it to the United States until 1910s, but once cars took over wagon trains heading west, the laws for drinking and driving and sentencing reform went through extensive changes. So did science. Along with the study of alcoholism, came the study of the now-defunct science of phrenology, which looked at the bumps, curves, sizes and forms of the head and skull area to determine a person’s personality and moral worth. This was a result of Gall’s Doctrine of 1860. Under the science of phrenology, a criminal could be detected by the size of the person’s head. But size wasn’t everything, direction mattered. “The various races also accord with phrenological science. Thus, Africans generally have full perceptives, and large Tune and Language, but retiring Causality, and accordingly are deficient in reasoning capacity, yet have excellent memories and lingual and musical powers. Indians possess extraordinary strength of the propensities and perceptives, yet have no great moral or inventive power; and, hence, have very wide, round, conical, and rather low heads. Although the doctor’s text says direction is more important than size, the science declared people with small formations were devoid of feelings and character, and people with large heads or designated areas, flourished with positive moral and intelligent character traits. Phrenology started as science, but turned into a fad. Despite its failings, it thrust society to consider the science of criminal behavior, and crime could now become part of science instead of religion. After Gall’s theory faded, around the 1890s, “Degeneration Theory” garnered more followers. This theory held that “degenerates” are a result of hereditary traits, but they could be reversed by good behavior. Good behavior was necessary for a productive industrial society. The 19th century was also the start of the asylum movement. Prior to the asylum movement, putting the mentally ill in prison was society’s way of ignoring the problem. It kept the mentally ill off the streets. Many of the “mentally ill” were merely women going through hormonal changes or experiencing anxiety or panic attacks. Their illnesses were labeled as “hysteria.” Patients were shackled to walls, often naked. Mental illness was seen as a moral failing. In earlier centuries, it was a sign of a demonic presence. The complex interconnected highways of genetics, chemicals and neural pathways science has mapped out today was unknown in the 19th century. Dorthea Dix and Nellie Bly pioneered asylum reform by exposing the atrocities and advocating mental health care reform. Today we recognize alcohol and drug addiction as a mental illness, and can view the brain images of personality disorders with expensive MRIs and PET scans. We know that certain people are predisposed to have a “killer” personality capable of murder without regret, but we also know that an abusive childhood increases the potential for a life of crime, but doesn’t guarantee it. We’re learning that graduating high school reduces the odds of arrest by 53% and odds of incarceration by 66%. As a society, that knowledge tells us that we can prevent crimes by improving the barriers to education, just as we can prevent future accidents from DUIs by investing in research for addiction treatment. Making MRIs and PET scans more affordable and accessible to mental health institutions can lead to early identification and prevention strategies, and provide the long-term evidence needed to support future scientifically based discoveries that benefit the individual and society as a whole. Treatment, not harsh punishment, has the profound potential to shape a safe society while retaining freedom for individuals. We already know that punishment for the mentally ill does not work. We know our personal choices are not free from the chemical inducement of our brain, and the chemicals in the brains of alcohol and drug addicts work differently than non-addicts. This does not mean that the addicts, violent-prone, sociopaths and psychopaths are innocent from their illegal actions, but it does mean that prevention strategies and sentencing penalties should be legislated and budgeted accordingly to be aligned with 21st century scientific knowledge in health and medicine, American civil liberties, and aligned with 21st century definitions of human rights, freedom and security. It’s recognized by the United Nations that prevention is more effective than intervention. Prevention is essential to establishing human security. Legislation budgets for courts, corrections, healthcare and social work should reflect that. If not, the social, legal and economic problems will remain. If we do not continue to progress, if we choose our laws unwisely and not based on science, we are at risk of returning to the days of hiding the mentally ill and the poor in prisons and mental asylums as we did in the 18th and 19th centuries. The difference is, today we understand mental illness and addiction far more than we did centuries ago. It would be a crime to sentence the mentally ill today the same as we did back then. Were You Arrested for a DUI, Again? If you’ve received a DUI and are a habitual offender, you’ll need an experienced attorney to negotiate your case and treatment plan. Prison sentences are mandatory, and fines will be high. An experienced attorney will look at your case to make sure that all evidence can be legally submitted, and that legal procedures were followed correctly. A skilled lawyer will recognize the increased burden of a habitual offender status, and advise you of all the sentencing standards and treatment plans available. If you’ve been arrested for DUI, call the Tiftickjian Law Firm in Denver at (303) DUI-5280 for assistance with your case today.